Mains examination is the crucial stage of Civil Services Examination (CSE). It is the most difficult part to crack. A good score here decides the rank and post of an aspirant. The combined marks of mains and interview are 2250. Of this, 1750 marks are from mains alone. Thus, this is the deciding stage in CSE. The mains exam is a descriptive exam. A carefully thought out preparation strategy will increase the chances of scoring. The extensive syllabus of the mains allows for such thorough planning. With an effective strategy in place, clearing CSE exam even in your first attempt becomes easy. In this write-up we shall present one such effective mains preparation strategy. 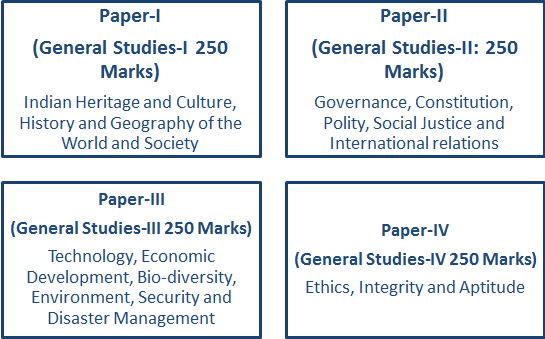 The mains examination consists of essay paper, four general studies paper, two optional subject papers, a language paper and an English paper. The syllabus of these papers is vast and diverse. A methodical study is required to cover such huge syllabus. The word huge is not meant to scare or discourage you. It is the fact of UPSC CSE examination. A paper by paper planning and preparation strategy is required. Although mains exam is different to prelims, preparation for both must be done simultaneously. This is because prelims and mains syllabus is common. Here we shall not be discussing about book lists and study materials. These have already been discussed in our other blogs. Instead, we shall look into the ways of preparation. Be precise while preparing for mains. Allocate specific time for each paper. One approach is to complete studying a gs paper at a stretch and going for the others. Another is to pick topics from different papers and study them every alternate day. Now, let us look at paper-by-paper preparation strategy. Note: In this write-up only general studies and essay paper are discussed. If we divide each gs paper on a thematic scheme, GS paper 1 will be a history themed paper. Major part of GS paper 1 syllabus is history with geography and societal issues being the other parts. The syllabic content is almost similar to that of prelims with the exceptions of world history and sociological topics. Be selective while studying world history. Stick to the topics mentioned in the syllabus. This will save you precious time. For sociological topics or say societal issues, follow the newspaper regularly. Questions will be asked from these issues only. Basics can be understood from NCERTs. GS paper 1, being the bulkiest of others ensures that the whole syllabus is studied at the earliest. This gives enough time for multiple revisions. For many aspirants, this paper is a drag as it has static syllabus. But, mind that this paper gives you immense opportunity to score marks above 120. Is it not easy to study a static syllabus than more analytical one? A note of caution: UPSC, over the years is blending current affairs with this static part. Analyze previous years’ papers and you can find the pattern. Thus, keep a keen eye on daily news events and analyze the static part with these events. Preparation becomes easier and stronger than your peers. The major portion of this paper being governance related, we can safely say that GS paper 2 is polity themed. Preparation must start with the understanding of Indian Constitution. This phase of preparation is similar to both prelims and mains. For this paper, some extra reading in polity needs to be done over and above the prelims syllabus. Special care must be taken to study various landmark Supreme Court judgements that transformed our polity; recent bills and amendments passed by the Parliament; government policies and programmes. This paper is heavily dependent on current affairs. So, keep track of day to day happenings of the issues mentioned in the syllabus. This is especially beneficial for tackling questions related to Indian diplomatic achievements and international relations. Dominated by economic issues of the country, this paper is economics themed. Various topics like India’s LPG reforms, budgeting, monetary policy, fiscal policy etc., are common for both prelims and mains. But in mains, questions test your analytical skills than memorizing facts. Be thorough in your preparation by updating your current knowledge. Look out for major national and international economic issues. Agriculture being the main economic source for many in the country, study issues that are bogging the sector in the country. As with other topics, here too newspaper is your biggest source of information. Science, technology and environmental issues mentioned in the syllabus too are covered via newspaper. Go through government websites if need be. The topic internal security needs special attention. By analyzing previous papers, it is safe to assume that about 40 marks can be scored from this topic alone. Understand the structural and organisational dynamics of security agencies in the country. Note down security related issues from newspapers and other authentic sources. Through this paper one can easily score marks above 120. It all depends on your understanding of current events. Ethics paper is one of the top scoring papers. The purpose of introducing this paper by UPSC is to test candidate’s ethical conduct while facing various governance issues. Thus, the importance of case studies in the paper. Stress must be laid on practicing case studies as many as possible. All the philosophical ideas and definitions can be studied from any standard book. Revision is important to score higher marks in this exam. For those beginning their CSE journey, it is advisable to take coaching for this paper. The essay paper tests a candidate’s wide understanding on issues at hand. UPSC too sticks to a pattern where essay topics are chosen from the current events. Essay paper does not need separate preparation. Reading newspaper regularly will suffice. Notes must be prepared from important editorials. They give you deep insights on the boiling topics. Practice at least one essay a week and increase the frequency while approaching mains exam. Get feedback on your essays from friends or lecturers. Feedback is important to identify your mistakes and rectify them immediately. Also, try different writing styles and choose the best that you feel comfortable at. At the actual exam, the essay topic you choose decides your success. Be 100% sure of the topic while choosing. We have often repeated these tips but it is pertinent to state them again. It is regarding health and motivation. It is understandable that the long drawn process is exhaustive and tiring. There will be phases of ups and downs. You need to take them to your stride and keep motivating yourself. When your feel low, talk to your parents and friends, do activities that re-energize you etc. When motivation levels are up, pick up that book and start preparing. Trending Topic: How Coaching institute Can help Crack Civil Service Exam? Keep health as a priority. Without good health, you will not be productive in your preparation. Maintain a healthy lifestyle and take healthy food.